Over the last few years, contractors have been “making do” with their logging equipment—but with things starting to improve for the industry, contractors such as Quesnel Bros. Logging of B.C. are starting to make equipment investments again. Canada’s second largest lumber producer has a new number one guy, with new CEO Don Kayne taking charge of lumber giant Canfor, and he’s got a strong focus on further developing the China market. B.C.’s Carrier Lumber has made a number of improvements to its Tabour sawmill near Prince George, the latest being the installation of a large log processing line made up of USNR equipment. With a revitalized coastal B.C. 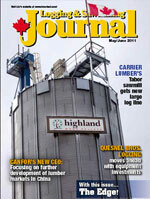 logging scene, Logging and Sawmilling Journal is pleased to present its authoritative list of the top B.C. Coastal and Vancouver Island logging contractors by volume. Woodville Pellet Corporation has built two new wood pellet plants, one in B.C. and another in Ontario, each of which will initially produce 60,000 tons of pellets a year, and serve several markets, including for bio-energy. B.C.’s Lo-Bar Log Transport, like all logging contractors, has had some tough sledding the last few years. But they’ve been able to grow, in part due to their fleet of efficient, fuel-sipping Ponsse harvesters and forwarders. New to Logging and Sawmilling Journal: The Edge! With this issue, Logging and Sawmilling Journal is now incorporating The Edge, Canada’s leading publication on research in the forest industry, into the magazine. Included are stories on Canadian Wood Fibre Centre/Natural Resources Canada and Alberta Innovates - Bio Solutions. Logging and Sawmilling Journal has the latest information on what’s new in the big world of small scale sawmilling, in this issue’s Tech Update. Tony Kryzanowski says forest industry businesses need to re-evaluate their business models, and that the standard model in the industry should be one of price making—rather than price taking. SELECT Sawmill Co. says that sawmillers can take production to the max with one of the company’s double-cut high production band sawmills. The units can be operated with a minimum of employees and can maintain a high cutting speed that can reach up to 3 feet/second depending on the application. 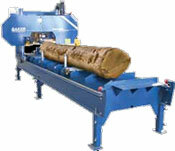 Both the 4221 commercial unit and 3620 portable bandmill offer top quality construction with fully hydraulic log handling and computerized setworks for optimum speed, accuracy and precision. With efficiency in mind, the company offers complete sawmill layouts including a range of accessory equipment such as a Rosserhead style debarker, heavy-duty edger, trim saws, conveyor systems, live infeed/outfeed decks and more. SELECT Sawmill Co. has been in the band sawmill manufacturing business for the past 14 years and has earned a reputation for the exceptional quality, workmanship and performance of its mills, the company says. Wood-Mizer Products, the world’s largest manufacturer of portable sawmills with over 50,000 mills world-wide, continues to bring new models and enhanced features to the market. For 2011, it has added three new mills to its line-up: the LT15GO, LT35HD and the LT70HD DCS, and it has re-featured many of the existing mill models. Wood-Mizer Products continues to increase blade manufacturer capacity and it now offers five different thicknesses, five different widths and five different tooth profiles, providing sawyers with a blade for most conditions and species. It has also augmented its AWMV product line by introducing its small log processing equipment, which allows owners to configure systems with modular components. The series includes vertical resaws, edgers and multi-head horizontal resaws. Baker Products focuses on providing power and high production in a heavy duty bandmill. The company has started manufacturing a new stationary band sawmill, the BP Dominator. It shares all the best features of the popular Blue Streak line of sawmills, such as 36” diameter log capacity, with additional upgrades that make the BP Dominator especially productive and user-friendly. There’s a 50-hp electric motor driving two huge 36” steel band wheels and a thin-kerf band blade, making log-to-lumber action smooth and easy. Then there’s the enhanced hydraulic system with improved forward and reverse feed and log handling. Computer setworks come standard. The BP Dominator’s frame is massive, made of two large I-beams for superior durability. Wallenstein’s WP wood processor is a smart approach to producing firewood, making it possible to say goodbye to exhausting days full of heavy lifting, strenuous bending and intensive handling. 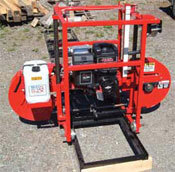 Now, firewood truly is a one-person operation with the WP wood processor. Match the speed and efficiency of up to three people: one person blocking and carrying, one person splitting, and one person stacking. The WP wood processor also brings the work up to the operator’s level, improving ergonomics and eliminating heavy lifting. This means no more back-breaking blocks that require carrying and lifting. Finishing the job is the four-way splitter that continuously piles the firewood exactly where you want it, without having to touch a single piece. When the job is done, the WP wood processor folds to a compact size and can be towed behind a vehicle. Built for high performance and durability, Wallenstein’s WP wood processor is powered by a Subaru engine and is backed with a three year warranty. Now in its 20th year, AVANT Tecno Oy from Finland is pleased to introduce to Canada a compact, powerful and versatile articulated wheel loader for professional and do-it-yourself use. All Avant loaders are less than two tons in weight. Avant loaders feature Kubota diesel power and they have the best lift capacity and hydraulic output in their class, says the company. There are over 100 attachments to choose from. For forestry work some attachments include: timber trailer with a loader unit, log cutter splitter, log grab, stump buster and a ripper. Avant Loaders have proven their capabilities in all working conditions, says the company. Silvana Import Trading Inc. offers the Logosol portable chainsaw mill. Designed to be used by anyone, the Logosol mill can cut beams, planks, boards, posts, and laths using a regular chainsaw equipped with a ripping chain. The company says the Logosol is incredibly easy to use. Its all-aluminum design makes it a robust yet portable piece of equipment. It will never rust when stored outdoors and its light weight allows it to be easily transported on the roof of a car. It is described as an ideal milling solution for all types of on-site construction projects. Silvana also imports the four sided Logosol PH260 and PH360 planer moulders. The Hud-Son Oscar 118 hobby sawmill is a small investment that will yield big results, says the company. It cuts up to 18” diameter logs, comes with a 6.5 hp Briggs and Stratton engine and two 6’ track lengths with log dog assembly. It is clutch driven with Hud-Son shoe blade guides. This mill can be easily stored when not in use. It is lightweight and can be rolled into a corner of a garage or barn. The blades are “shoe guided”, which offers the best blade support on the market, says Hud-son. The sawmill has a standard 1.5” diameter shafting with heavy duty bearings. The unit is pushed through the log with almost zero effort. It has a hand crank winch to adjust for board thickness. Accurate enough to cut paper thin boards, maximum board width is up to 16”. This sawmill is said to be ideal for sawing logs into boards or resawing to the needed dimension. When a board or two is needed, they can just be sawn up right on the spot. The unit is compact but said to be built tough. In Canada, it is available through Musquodoboit Valley Resource Supply Ltd., Upper Musquodoboit, Nova Scotia. From a small farm shed in Victoria, Australia, the Lucas family established Lucas Mill Pty Ltd in 1994. Today, over 12,000 machines have been sold into more than 100 different countries. In the current climate of environmental awareness, the Lucas Mill portable sawmill represents an ecologically sustainable option towards the recovery of timber from forests. The Lucas Mill can be transported to almost any location and set up to select harvest timber with minimal impact to the surrounding environment. Lucas Mill produces five different circular swing-blade machines, ranging from a 6 ¼” model up to the versatile 10” model. Options are available for each model including slabbing, planing, sanding and weatherboard attachments. SMG Champion Portable Sawmill Ltd. has entered its 14th year and according to the company is going strong. Its sawmill is the result of years of experience from working with wood-related manufacturers, metal machinists and mechanics. It was designed and crafted in close cooperation with sawmill operators, with the result being a machine that is reliable, rugged and user friendly, says the company. The sawmill is assembled in Quebec from parts manufactured by a few selected shops whose experience have been incorporated into the product, delivering a high quality mobile sawmill. In 2007, Champion Portable Sawmill Ltd. celebrated its 10th anniversary by investing over $2.5 million in a new business office and assembly plant. The showroom is over 3610 square feet and displays a wide range of forestry equipment for both the woodlot owner and homeowner. The company is now looking to the future. With its new and improved production capabilities, it is expected to pursue the expansion of its dealerships and representatives in Europe, South America and Central America. In 2011, it is undertaking an extensive effort to satisfy its U.S. and European clients and facilitate the availability and exposure of its products to the U.S. and European markets.